Tequila is the most famous Mexican drink, but all three of these beverages are consumed in Mexico. They are all made from the agave plant, known as maguey in Mexico. Agave, sometimes called "Century Plant" in English, is common throughout Mexico and the Southwest United States. Its uses are incredibly varied: it has been used for its fiber, for food, and in ancient times the thorns were used as needles and for blood-letting ceremonies. In recent times, the sap, called aguamiel has been converted into agave nectar, a natural sweetener with a low glycemic index. However, its most common use throughout time has been to make alcoholic beverages. Mezcal can be made from a few different varieties of agave, though most mezcals on the market are made with Agave espadin. In the process for making mezcal, the heart of the agave plant, called the piña, is roasted, crushed, fermented and then distilled. Which roughly translated means: For all hardships, mezcal and for all good fortune as well, promoting the notion that mezcal is appropriate for any occasion. Mezcal is still made in the traditional way in many areas of Mexico and is exported, though no mezcal is as well known as Mezcal de tequila. Tequila is a spirit that is made exclusively from a specific agave plant, the blue agave or Agave Tequilana Weber. It is only produced in the region of western Mexico around the town of Santiago de Tequila, Jalisco, about 40 miles (65 km) northwest of Guadalajara. Over 90,000 acres of blue agave is under cultivation in this region of Mexico, which is now a UNESCO World Heritage Site. Tequila has become a national symbol of Mexico, and although it may have earned its popularity among the spring-breaker crowd and those looking to get drunk fast, premium mezcals and tequilas also appeal to those with more discriminating tastes. 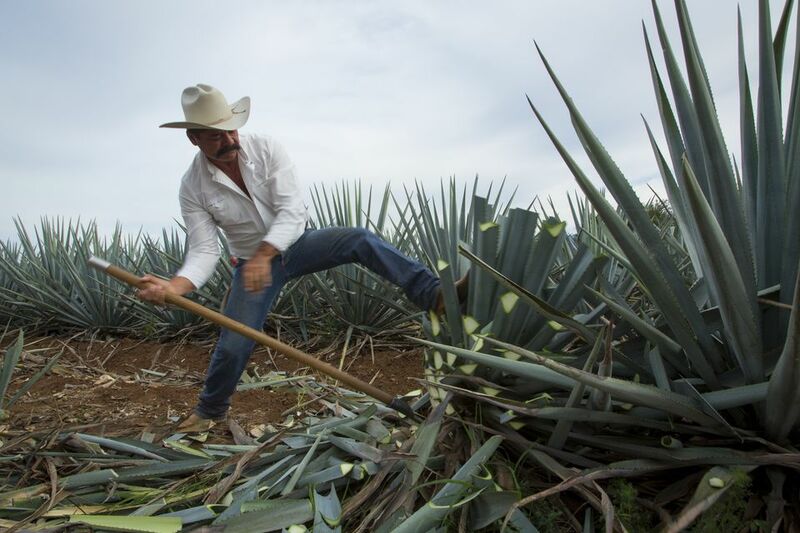 The highest quality tequilas have 100% agave printed on the label - this means that no other sugars have been added. A visit to Tequila will allow you to learn about tequila's history and production. Tours are offered by several leading distilleries. A popular way to get to Tequila is by taking the Tequila Express train from Guadalajara. The train ride lasts about two hours, traveling through a stunning desert landscape. Refreshments are served on board and entertainment is provided by a mariachi band. Although drinking tequila shots is a very popular activity, and there is some debate about the "correct" way to shoot it (salt or lime first? ), tequila connoisseurs say that it is a complete waste to shoot a fine tequila or mezcal, and they recommend that it be sipped, either alone or with sangrita, a mixture of tomato, orange juice and lime juice, spiced with chili powder. Pulque ("pool-kay"), called octli in Nahuatl, the Aztec language, is made from the sap of the agave plant. To extract the sap, a cavity is cut into the heart of an 8 to 12-year-old plant. The sap is then extracted with a fat wooden tube placed in the heart of the plant. The sap is called aguamiel (literally honey water), or agave nectar because it is very sweet. The nectar is then fermented to make pulque. The resulting liquid is milky and slightly sour tasting. Sometimes fruit or nuts are added to change the flavor. Pulque's alcohol content, dependent on the degree of fermentation, ranges from 2 to 8%. This was the alcoholic drink of ancient Mexicans as they did not have the distillation process. In ancient times its consumption was restricted and only priests, nobles and the elderly were allowed to drink it. In colonial times pulque was widely consumed and became an important source of revenue for the government. Haciendas producing pulque were an important part of the colonial economy and remained so during the first century of Mexico's independence. There are establishments called pulquerias where this drink is served. In the past, there was a whole popular culture that grew up around pulquerias, which were almost exclusively frequented by men. However, in present times the number of these establishments has diminished considerably. The low alcohol content and complex fermentation of pulque limit its distribution. However, pulque is still consumed today - it is sometimes served at fiestas or sold in markets, and in neighborhood pulquerias.